The Life and Adventures of Nicholas Nickleby is an 8½ hour-long adaptation of Charles Dickens’ novel, performed in two parts. Part 1 was 4 hours in length with one interval of 15 minutes. Part 2 was 4½ hours in length with two intervals of 12 minutes. It was originally presented onstage over two evenings, or in its entirety from early afternoon with a dinner break. Later it was presented on television over four evenings. The opening night was on 5 June 1980. The show ran for an 8-week season at the Aldwych Theatre, playing Part 1 on some nights and Part 2 on others with both parts playing together on matinée and evening performances. It was revived for two further 8-week runs at the Aldwych in the autumn season of 1980 and the spring season of 1981 before being filmed for Primetime TV at the Old Vic Theatre and transferring to Broadway for the autumn season of 1981. A further revival with a substantially different cast played at the Royal Shakespeare Theatre in Stratford and toured to Los Angeles and Broadway in 1985. 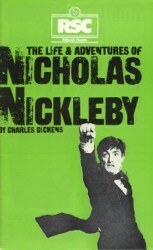 The play was adapted by David Edgar from the Charles Dickens novel The Life and Adventures of Nicholas Nickleby. Directed by John Caird and Trevor Nunn, the music and lyrics were from Stephen Oliver and the set design was by John Napier and Dermot Hayes. It transferred to the Plymouth Theatre on Broadway, initially opening 4 October 1981 and running until 3 January 1982. Revivals of the original production were produced in 1986 (which returned to USA for a Broadway run and national tour) and a truncated version from 2006 to 2008. The original London production is documented in Freeman, John, The Greatest Shows on Earth: World Theatre from Peter Brook to the Sydney Olympics. Libri: Oxford ISBN 978 1 907471 54 4. The original London cast included Roger Rees as Nicholas, David Threlfall as Smike, Ben Kingsley as Squeers, Bob Peck as John Browdie and Sir Mulberry Hawk, John Woodvine as Ralph Nickleby, Susan Littler as Kate, Edward Petherbridge as Newman Noggs, Timothy Spall as Young Wackford and Mr. Folair, John McEnery as Mr. Mantalini, William the Waiter and Mr. Snevellicci, Graham Crowden as Mr. Vincent Crummles, and Suzanne Bertish as Fanny Squeers, Peg Sliderskew and Miss Snevellicci, among many others. All actors apart from Rees played multiple roles. Some parts were recast in November 1980, with Fulton Mackay playing Squeers, Emily Richard taking the role of Kate Nickleby and Christopher Benjamin as Crummles. Fulton Mackay and Timothy Spall had left the company by the time the production moved to Broadway and were replaced by Alun Armstrong and Ian McNeice respectively. When the Aldwych production closed in the summer of 1981 the set was moved to the Old Vic Theatre and the work performed for a four-part mini-series by Channel 4 and Mobil Showcase Theatre., which was telecast in the US in January 1983. The full-length version of the play was produced by three American companies subsequent to the RSC. The Great Lakes Theatre Festival, formerly Great Lakes Shakespeare Festival in 1982 with a revival in 1983, directed by Edward Stern and Robert Lanchester, and Kansas City Repertory Theater, formerly Missouri Repertory Theater, directed by James Assad and Leon Rubin in 1983. The third production was in February and March 1984 by the students at Herbert Henry Dow High School, Midland, Michigan, directed by J. Michael Reilly. The production was revived for the Royal Shakespeare Theatre, Stratford-upon-Avon, in January 1986. A second Broadway production ran from 24 August 1986 to 12 October 1986 at the Broadhurst Theatre and was nominated for the 1987 Tony Award for Best Revival. Despite the play's success, its length and the size of the cast required means that it is seldom revived, although in 2006 Edgar prepared a shorter version for a production at the Chichester Festival, which transferred in December 2007 and January 2008 to the Gielgud Theatre in the West End. This version has been produced in the US by the California Shakespeare Festival, Playmakers Repertory Theater and a production was performed at The Lyric Stage Company of Boston in October – December 2010. Although audience reception was enthusiastic, critical reception was mixed. Frank Rich in New York Times reported dull passages piling up as "dead weight", while John Simon in the New York Magazine felt that the work was a "middlebrow enterprise" doing "scant justice" to the novel. In contrast Mel Gussow, again in The New York Times, noted that "Nicholas Nickleby remains true to Dickens – many of the lines are taken directly from the novel, dialogue as well as narration – and to first principles of theater" when describing the RSC's recast production in 1986. Playwright and reviewer Thomas Hischak, writing in retrospect about the 1981–82 New York season, judged the production as the "centerpiece of the season...a theatrical experience of a lifetime" and in London Bernard Levin of The Times found "a ceaselessly entertaining...dramatic triumph" and despaired of the cavils of his fellow critics. He concluded: "…we come out not merely delighted but strengthened, not just entertained but uplifted, not only affected but changed." Edgar's writing for the stage is avowedly political and his treatment of Dickens's novel, with its descriptions of poverty and as its central subject matter the wickedness of money-broker Ralph Nickleby, sought to draw parallels between the social conditions of 1830s Britain with what he saw as the growing political climate of selfishness in the 1980s. However, the RSC's ebullient staging, the necessary happy ending (brought about by benevolent capitalism as represented by the Cheeryble brothers) and even the huge commercial success of the play itself diminished the impact of his message. 1980 Laurence Olivier Awards: Play of the year; Director of the year; Designer of the year; Actor of the year in a new play: Roger Rees; Actor of the Year in a Supporting Role: David Threlfall; Actress of the Year in a Supporting Role: Suzanne Bertish. The RSC filmed the play as it was performed in a theatre, The Old Vic, with a live audience present, shortly before taking the show to Broadway. Two extra versions of "the story so far" (which originally recapped part one for theatregoers returning for part two) were filmed, to introduce the third and fourth parts for television. ^ Prior, Michael (29 September 2006). Dreams and Reconstruction: A Cultural History of British Theatre: 1945–2006. Morrisville, North Carolina: Lulu Inc. p. 232. ISBN 1-4303-0857-5. ^ a b Ellen Goodman, ed. (5 June 1980). Performance programme: Nicholas Nickleby. Royal Shakespeare Company. ^ a b Staff. "The Life and Adventures of Nicholas Nickleby". Internet Broadway Database. Broadway League. Retrieved 13 October 2008. ^ Ellen Goodman (13 November 1980). Performance programme: Nicholas Nickleby. Royal Shakespeare Company. ^ "Entertainment Section". Detroit Free Press. 19 February 1984. p. 69. Retrieved 12 November 2018. ^ "The Life and Adventures of Nicholas Nickleby". Internet Broadway Database. Retrieved 13 October 2008. ^ "Nicholas Nickelby by David Edgar", PlayMakers Repertory Company. ^ Samuel, Raphael (1996). Theatres of Memory. London: Verso. p. 422. ISBN 1-85984-077-9. ^ Rich, Frank (5 October 1981). "Stage: 'Nicholas Nickleby' Arrives As a Two-Part, 8½ Hour Drama". New York Times. ^ Gussow, Mel (25 August 1986). "Stage: 'Nicholas Nickleby' Returns". New York Times. ^ Hischak, Thomas S (2001). American Theatre: A Chronicle of Comedy and Drama. Four. New York: Oxford University Press. pp. 188, 192. ISBN 0-19-512347-6. ^ Levin, Bernard (8 July 1980). "The truth about Dickens in nine joyous hours". The Times. London (60671): 14. ^ Lacey, Stephen (2004). "British theatre and commerce, 1979—2000". In Kershaw, Baz. The Cambridge History of British Theatre. 3. Cambridge, England: Cambridge University Press. pp. 435–6. ISBN 0-521-65132-8. ^ Kalson, Albert (1991). "From agitprop to SRO: the political drama of David Edgar". In Braendlin, Bonnie. Cultural power, cultural literacy. Gainesville, FL: University Press of Florida. pp. 96–7. ISBN 0-8130-1096-9. ^ Staff (24 April 2008). "Olivier Winners 1980". The Society of London Theatre. Retrieved 13 October 2008. This page was last edited on 6 April 2019, at 23:42 (UTC).